I am not up to writing much this week, but I do need to update you on the latest news! I have now officially lost 50 pounds! I was also measured and I am 1-2 inches smaller in all of the places that they measure. It is very exciting. 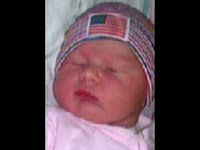 To celebrate the loss of my 50 pounds I found photos on the net that represent the weight. For about two weeks my right shoulder and arm would be throbbing in pain by the end of the day. I could not understand what was causing the trouble. I started taking Aleve to get through the afternoon, but if I was out of pain killer I would have tears in my eyes due to the intense pain when I tried to click my mouse or type. Late one evening, a friend of mine called me with an explanation. She said; "You're bum is a lot smaller, at least 2 inches lower, you need to raise your chair." Sure enough, I raised my chair and the carpal tunnel symptoms are gone. I am trying to drink tea. Apparently, tea has antioxidants and other qualities that make it worth my time even though I detest the taste of tea. Of course, as popular magazines often quote - green tea is the best. So far, drinking the tea ranks right up there as one of the harder aspects of my endeavor to live a healthier lifestyle. I have found some teas that are palatable, but I still believe tea is just dirty water. It is a sad time for me. My favorite binge food of all time will soon cease to exist. The folks that bought Archway over 10 years ago filed for bankruptcy. Of course, some of the executives at Specialty Foods will possibly be going to prison for cooking the books. I can only assume they studied at the same business school as former executives of Tyco and Enron. There is nothing better than an Archway Raspberry Filled Cookie. I can eat a whole pack in one sitting. What is special about Archway cookies is that it was my FIRST binge food that I can remember. Grandma and Grandpa used to have them and I could eat the whole package. Once I became an adult I learned not to binge on the cookies so I never bought them. It is the ONE food that I have not binged on consistently in the past 10 years. 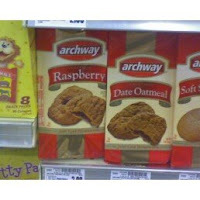 Tonight I will buy my last package of Archway cookies. I plan on taking 2 out and freezing the rest in individual packages for special treats. I went for my bi-monthly check today. I gain a half pound as I expected before going in, but also as expected it was water weight. I lost 1.5 pounds of fat. I realized today that at the end of this month I will be at seven months of my lifestyle change. I think I am doing quite well! I will get new blood tests next week so the physician can check to see what changes have occurred in my cholesterol, “sugar”, etc. It will be interesting to see those results. Til Next Week, when I will talk about TEA! October 8, 2008 - Striving for a more active lifestyle.. I am losing weight, but continue to have the most difficulty with consistent exercise and a more active lifestyle. So, using a concept I learned from SparkPeople, I created a list of activities to perform to begin the healthier lifestyle habit. I am hoping also at the end of the 40 days to join an exercise class to continue my exercise regimen. I will let you all know how this goal works out for me. Take the stairs all day. Dance for 10 minutes, like no one is watching. Take a long walk with the dog. Park as far away as possible at the store. Use a basket and carry it at the store. Watch TV only with the treadmill. Do some desk exercises at work three times today. Walk while talking on the phone. Take the long route. For example, if headed a destination downtown, take a walk around the block first. Take a mile walk for a break at work. Wear a pedometer and walk 10,000 steps today. Perform stretching exercises this morning for at least 10 minutes. Complete an exercise video today for at least 10 minutes. Do interval training on the treadmill for at least 10 minutes. Go for a hike for at least 10 minutes. Do 50 push-ups against a wall. Perform bicep curls with a grocery bag. Do yoga for at least 10 minutes. Sit on the exercise ball for at least 10 minutes. Jump on trampoline for at least 10 minutes. Use stair climber for at least 10 minutes. Use exercise bike for at least 10 minutes. While waiting today, perform exercises (e.g. jumping jacks, pacing, arm swings, stretching exercises, etc). While doing things around the house, wear a backpack with weights in it. Put on clogging shoes and clog for at least 10 minutes. When get to work, walk around the block before going into the building. Do the same when leaving. While cleaning, use exaggerated movements (e.g. wave arms more). When no one is looking, skip instead of walk. Better yet, do it even if they are looking. Who cares what they think. Skip around the house at the end of the day. Be sure to carry cell phone in case fall in a hole. Play tag with the dog. Run everywhere. Run to the car in the parking garage. Run to the house. Again, carry cell phone in case I fall and trip. When sitting squeeze gluteus maximus 15 times, 4 times today. When standing in line, stand on tip toes as long as can. Do kegel exercises 15 times, 4 times today. When driving, do car exercises while waiting at stop lights. Skip the drive-up. Walk inside. Perform weight training for at least 10 minutes today. Stretch in the morning, in bed, before getting up for the day. Do simple stretches for 10 minutes. Take the long way to the water cooler, break room, bathroom, etc. All day. Perform squeezing exercises with exercise ball at desk 15 times both arms, 4 times today. October 1, 2008 - Grandpa said; "You are getting fat"
My paternal Grandfather was an interesting man and I loved him unconditionally. Through him I learned to: create and sing my own songs as I do my daily life chores; how to give a good pet a good scratch behind the ears; avoid hitting utility poles when the roads are icy; annoy my Mother; and various other life lessons. There is one life lesson that I recently learned from him even though he passed on several years ago. He was the only person in my life who directly told me; "You are getting fat." I do not remember the exact date, but I was traveling and gone away from home for three weeks at a time. I had a dream job. My job was to train sales people how to use Microsoft Outlook and Windows NT. I went to places like Miami, Los Angeles, Virginia Beach, Clearwater, etc. It was an easy job with the best food I could eat. The time period was late 1998 or 1999. I don't know when I started to gain weight. I did not have weight problems as a child or in college. Sometime after graduating college I started to get unhealthy (or unhealthier) - mentally and physically. I tried and took many medications to combat both problems which more-than-likely exacerbated both. As I go through and complete some scrapbooking projects this winter I will be able to look at pictures and see the progression of my gain. The thing I now know is that as I lose weight, the weights look unfamiliar. I did not weigh myself all those years (over TEN YEARS). The doctor would weigh me, but I did not hear (or care) what the scale said. I could give the excuse that I had other greater concerns - a true statement. However, I am learning that being healthy is not about treating the symptoms (e.g. the blues, mysterious aches and pains, stomach problems). Being healthy is about taking care of me and me first. I must continue on a daily basis to eat healthy, forgive and reward myself, get proper exercise, etc. By accomplishing some of the basic necessities my symptoms are lessened or in some cases gone completely. Grandpa, these first 46 pounds lost are for you..
P.S. 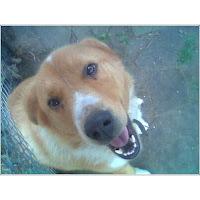 The picture is of my dog Sandy (the best dog EVER). This weekend is his favorite time of year. Canal Days in Metamora! He gets to sit with us all day and beg treats off of the tourists and the Corn Dog Man!